Toyota has been the last major automaker to resist ceding the user experience of its in-car infotainment systems to dangerous, bloodthirsty outsiders like Apple and Android. That hard line appears to finally be cracking, with the 2019 Toyota Avalon announcement mentioning support for Apple’s CarPlay, with support on more vehicles to follow. As of press time, Toyota has not announced any plans to support Android Auto. Or the two people with Windows Phones. 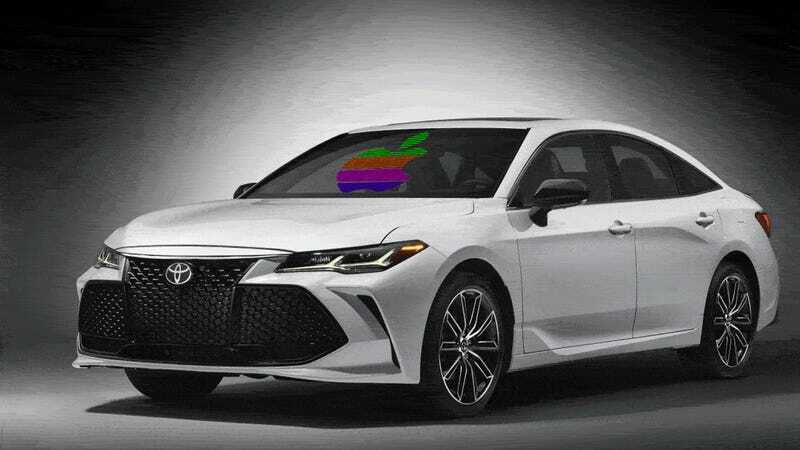 MacRumors reports that CarPlay will work first with the new Avalon, then onto more Toyota and Lexus models that support Toyota’s Entune 3.0 and Enform 2.0 infotainment systems. CarPlay support will only work via a wired USB connection. Toyota’s reluctance to support popular third-party UI systems on their center stack displays is a bit baffling when you look at their in-house systems, which, at best look like cheap knockoff cellphone interfaces or, at worst, use clunky, awkward control setups that nobody likes. Now, finally, on at least one model, in the United States only, Toyota has grudgingly agreed to let you use a somewhat better on-screen interface. Oh, thanks, Toyota. Mighty big of you. Toyota is also adding support for smartwatch and Alexa voice-control of car functions like remote start and unlocking. No announcements have been made yet about Alexa skills where you can drive the car just by yelling “Left! Right! Slow down! Stop! Stop! Okay, go!” or anything like that.